Take dal into a deep bowl and add water. Wash the dal well and discard water. Add fresh water and soak the dal overnight. When the dal is soaked well remove water to grind the dal. To grind the dal use a mixer grinder or a wet grinder. Here I have used a wet grinder to grind the dal. Add soaked dal to the wet grinder and add sufficient water. Grind the dal till smooth. Add water in intervals to grind the dal till smooth and fluffy. Take the ground dal into a conbtainer and add salt. Mix well and the batter is ready to make KUDUMULU. A KUDUMU PATRA has a container with lid and two plates. The KUDUMU PATRA resembles an IDLI PATRA but smaller in size with two big plates. Add water into the container up to the first notch from the bottom. Take two cloth pieces of the size of the plates of the KUDUMU PATRA. Dip the cloth pieces in water and press to remove excess water. Spread the wet cloth pieces on the plates. Pour batter into the plates over the wet cloth. When water in the container is boiling, lower the flame and arrange the plates in the container. While arranging, first insert the small plate by holding the knob on the plate. Then arrange the second plate over the first plate, taking care to arrange in such a way that the knob of the second plate is placed opposite to the knob of the first plate. By arranging this way the batter in the first plate will not stick to the plate arranged above it. Cover the container and cook on high flame till steam builds up in the container. When steam forms in the container, it will try to escape through the small gaps at the lid of the container. By placing your palm near the lid one can feel the steam escaping through the gap. Then lower the flame (to SIM) and cook for 7 to 10 minutes or till the KUDUMULU are cooked. To test, wet your fingers and touch the KUDUMU. The KUDUMU is done when no batter sticks to the wet fingers. If the batter sticks, then steam for some more time. When it is done, switch off the stove and carefully remove the plates holding the knob. Cool the KUDUMULU for a while. After few seconds, holding the cloth invert the KUDUMU into a plate along with the cloth. Gently remove the cloth from the KUDUMU. 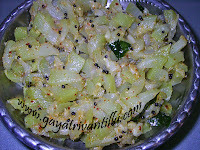 Serve hot KUDUMU with Karapodi or Nuvvu podi or with any chutney or pickle of your choice. 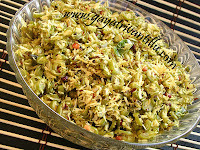 While serving spread a spoonful of ghee on the KUDUMU and serve. With 100gms of black gram we get two KUDUMULU. Soaking dal overnight gives best results—however if it is urgent soak dal at least for 4 to 5 hours. While grinding dal, add water in small intervals to grind to desired consistency. The batter should not be runny or too thick. The batter should be thick but spreadable. Grind dal till smooth and then mix salt. Take care while arranging and removing the plates as steam burns are very dangerous. Use mittens or long holders to insert and remove plates. Ghee adds a great taste to hot KUDUMU. Take a wide vessel with water in it. Tie a cloth to the mouth of the vessel and heat this vessel. Pour batter on the cloth and cover with a lid and steam to make KUDUMU. Now it is made simpler using the KUDUMU PATRA and two pieces of clothes. As a novelty I introduced it. 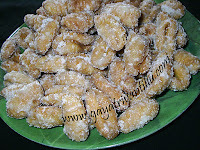 Kudumulu can be prepared with the help of Idli Stand which is generally available in all houses. One KUDUMU per person is sufficient as this will be heavy on stomach. t's a heavy dish, on stomach because of 100% lentils. One may be tempted to have more than one Kudumu. However, it's advisable to restrict it to minimum. As day progresses, Kudumu releases energy and one won't be hungry for a long time after having one Minapa Kudumu. In India it's a popular dish amongst farming community who work on fields and people who exert lot of physical work during the day. Remember that Minapa Kudumu should be served hot only and should be avoided during nights. Our ancestors knew the positive and ill effects of Black gram. The positive aspect was - Black gram helps in absorption of natural calcium and related items from our regular food to keep our bones healthy. They included it in regulated quantities in the day to day food. That's how we got so many breakfast items - Garelu, Vada, Idli, Dosa, Dokhlas etc etc. This intake used to ensure the required Bone Density, for which our grand parents were healthy and energetic. Black gram strengthens bones and is advised for those who are suffering from fractures. It is advisable to eat MINAPA KUDUMU for 40 days continuously for those who are suffering from fractures. GARELU, DOSA also show similar results but the oil in these preparations makes them heavier dishes. As MINAPA KUDUMU is just a steam preparation, we get the full benefits of Black Gram. As regards the story - the famous Sanskrit author "Kalidasa" when was presenting a series of novels, dramas, poetry etc. in quick succession, his opponents in literary circles approached his cook and asked him to prepare more and more tasty recipes with Black gram and feed the poet. Its believed that Black gram blunts intellectual abilities!!! Its Energetic Life (with Healthy Bones) Vs Intellectual Abilities. Now you decide how much of Black-gram one should eat. Would you tell us how to make “MINAPAROTTI” ? mee sweets list lo obbattu/bobbatlu recipe ledu, ela cheyalo choopinchandi pls.. I liked your website . Everything is so clear and easy. Specially the video clipings are so helpful. I am eager to try all the reciepes.